You’ll notice that unsolved murders will become a theme on this blog, and it won’t be from choice. Sadly there is a shocking number of cases in Ireland where families of murdered loved ones are still awaiting justice. We aren’t talking Troubles’ related cases here, paramilitary or even gangland executions, these are investigatioms where there has been an abundance of evidence (and in one well known case a confession) which resulted in no convictions whatsoever. One of those cases is Jim Goonan. The Co Offaly man was found dead at his home in 2002. Despite the walls of Jim’s bedroom being splattered in blood, a deep 10cm gash to the back of his head and 38 separate marks to his body, gardai concluded he died from a fall down the stairs. Below is a piece I did with Jim’s sister Nuala Ramseyer published earlier this year. A WOMAN whose brother died in suspicious circumstances says the tragedy caused the death of both her parents. Devastated Nuala Ramseyer told how her elderly father Paddy “faded away”, while her mother Sheila, 80, took her own life after the violent death of their son Jim Goonan. The 49 year-old from Co Offaly was found dead at his Birr home on March 11, 2002. Despite his blood found splattered around the walls of his bedroom, a 10 cm gash to the back of his head and 38 separate marks on his body, gardai concluded he died after accidentally falling down the stairs. However his family has always maintained foul play was involved in his death. Today Ms Ramseyer, who previously took her fight for justice to the Supreme Court, tells how Mr Goonan’s death ripped her close knit family apart, and how questions over his killing haunt her every day. She also bravely reveals horrific crime scene photographs of the bedroom where she believes her brother met a violent death. 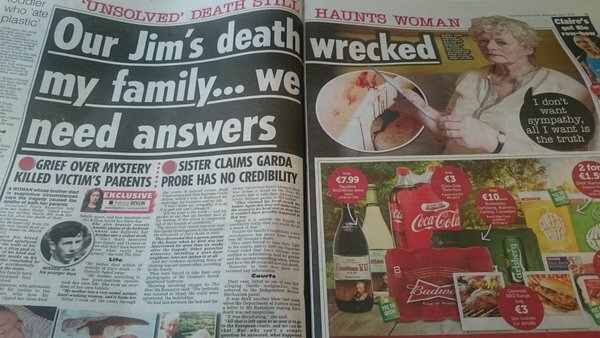 “Jim’s death destroyed our family and 14 years on we still don’t have answers over what really happened,” the Co Kildare woman told The Star. “My father died within 18 months of Jim’s death, he literally faded away. “My mother, according to her post-mortem results took her own life. She took an overdose of her own tablets, she took arrhythmia as a result. “And my mother was a very sound, normal, hardworking woman, and it broke her. “After I took all the cases through the courts of judicial review, high court action and then Supreme Court action, which I won, it destroyed my marriage, my business and my life. “I don’t want any sympathy, it is as it is and you can’t change it. The family first raised concerns over the garda investigation in the immediate aftermath of Jim’s death in 2002. They discovered that a person present in the house when he died was not interviewed for more than six weeks after the tragedy. Other potential witnesses, including a next door neighbour, were not spoken to at all. Key evidence, including items of clothing, were not seized either according to the family. They were who were forced to take their own photographs of Mr Goonan’s blood splattered bedroom. Showing shocking images to The Star, Ms Ramseyer said: “The bedroom was covered in blood, the walls were splattered, the bedclothes. “He had lain between the bed and the locker for several hours because there was inches of blood on the floor. We actually had to take these pictures ourselves, because gardai didn’t bother. “They claimed his head struck the locker. Again this does not make sense, the wound to his head was so deep that it couldn’t have possibly happened in that way. Despite appeals from the family over their suspicions, a new investigation has never opened into Mr Goonan’s death. They were forced to take their fight through the courts, and in 2005 the Supreme Court ruled that Jim’s brothers and sisters were entitled to information held by gardai and the coroner regarding when, where and how the 49 year-old met his death. However to date they have not received any information. Their case, listed as one of over 320 alleging garda malpractice, was referred to the Independent Review Mechanism panel. It was dealt another blow last week when the Department of Justice issued a letter to Mrs Ramseyer stating Jim’s death was not suspicious. Speaking about the emotional impact her 14 year fight has had, Mrs Ramseyer said: “It weakens you. It does something to your psyche, you feel as if you have been violated. You feel a terrible detachment of what is right and what is wrong. “I feel like I don’t want any contact with those people again. I feel they have brought such terrible pain into my life.